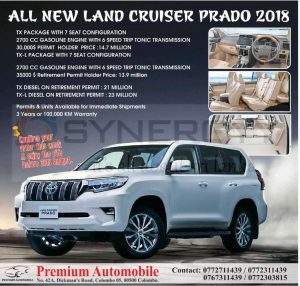 Premium Automobile, leading importers of luxury automobiles announces their latest promotion for your dream All New Land Cruiser Prado 2018 for Rs. 14.7 Million for Permit Holders and Rs. 21 Million for retirement permit. Toyota Lanka brought you Brand new Toyota Coaster for Rs.7,850,000.00 upwards with 3 years/100,000 km Warranty and 3 free services registration. 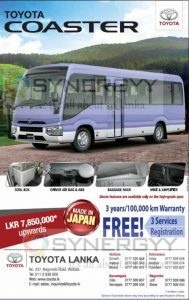 Toyota Coaster High grade spec comes with special features of Mike & amplifier, Cool box, Baggage rack and Driver air bag & abs. 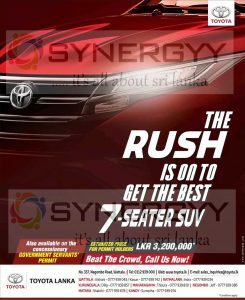 For more details about the leasing availability and promotions and upgrade versions contact to Toyota lanka, No. 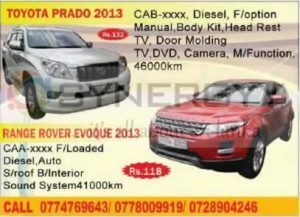 337, Negombo Road, Wattala. 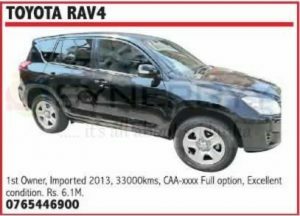 Toyota Rav4 available for sale at a price of Rs.6.1 Million, this Toyota Rav4 imported on 2013 and the 1st Owner done 33,000kms by now, registration starts with CAA-xxxx & Full option with an excellent condition. 2007 Toyota Corolla 141 car available for sale at a special price of Rs. 3.5 Million, the car registered on 2007 December in excellent condition with 122,000kms. Toyota Harrier Hybrid 2015 for sale at a price of Rs. 15.5 Million (Negotiable). This Toyota Harrier Hybrid 2015 is a Premium Advance Package / ANXGB-A with registration number of CAK-4xxx, Pearl White, Crystal Shine. Toyota Harrier Hybrid 2015 with Genuine Mileage 20,000km, Serviced & Maintained by Toyota Lanka (Pvt) Ltd.
Buy your dream highest grade 2005 brand new Land Cruiser Prado 121 TZ with registration number of -**KA-**** of 7 seater Full Option now available for sale at Rs. 8,975,000/-. 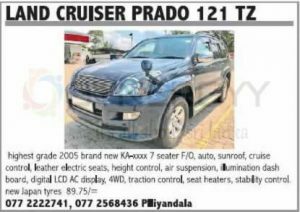 2015 Land Cruiser Prado 121 TZ comes with extra features of auto, sunroof, cruise control, leather electric seats, height control, air suspension, illumination dash board, digital LCD AC display, 4WD, traction control, seat heaters, stability control and new Japan tyres. 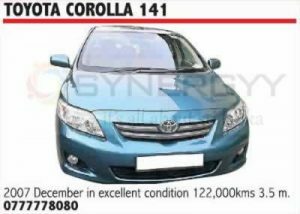 City Auto Traders of Pannipitiya announces a special price for Toyota Corsa 1992 for 1.45 Million. Toyota Corsa 1992 is a 1450cc Diesel vehicle with 185,000 mileage by 4th owner. 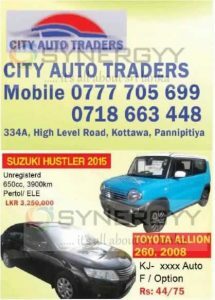 City Auto Traders of Pannipitiya announces a special price for Toyota Rush 2008 for 4.05 Million. Toyota Rush 2008 is an auto full option vehicle. City Auto Traders of Pannipitiya announces a special price for Toyota Aqua 2013 for 4.15 Million. Toyota Aqua 2013 is an auto full option hybrid vehicle with 26,000 mileage. 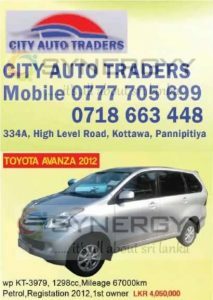 City Auto Traders of Pannipitiya announces a special price for Toyota Avanza 2011 for 3.575 Million. Toyota Avanza 2011 is a 1298cc petrol vehicle with 88,000 mileage & 3rd owner. City Auto Traders of Pannipitiya announces a special price for Toyota Belta 2010 for 3.975 Million. Toyota Belta 2010 is a 1300cc auto full option vehicle with 38,000 mileages. 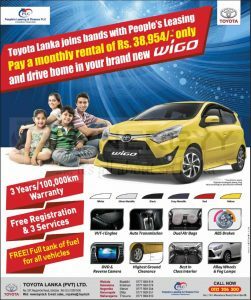 City Auto Traders of Pannipitiya announces a special price for Toyota Aqua 2012 for 3.925 Million. Toyota Aqua 2012 is a auto full option vehicle with 64,000 mileage by 1st owner. City Auto Traders of Pannipitiya announces a special price for Toyota Avanza 2012 for 4.05 Million. Toyota Avanza 2012 is a 1298cc petrol vehicle with 67,000 mileage registered on 2012. City Auto Traders of Pannipitiya announces a special price for Toyota Allion 260; 2008 for 4.475 Million. Toyota Allion 260; 2008 is a 1500cc petrol vehicle with full option. City Auto Traders of Pannipitiya announces a special price for Toyota Prius 2012 for 4.95 Million. Toyota Prius 2012 is a petrol hybrid vehicle with 64,000 mileage registration made on 2014. WP KM – ####, 2010 ZX Fully loaded, Dolby digital super live sound system with factory fitted 3way camera, Beige leather electric seats. Sun roof. 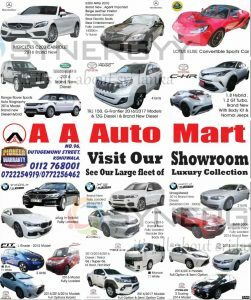 Factory fitted rear entertainment tv, Rear power suction door, Airmatic hight control, crawl control and many more options, Services and maintained by Toyota Lanka in mint condition. Exchange can be considered and the price is Rs. 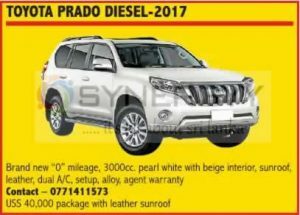 18,500,000/-, for more details contact to Premier Auto Mart, No:145/5 B, DutugamunuStreet, Kohuwala (In front of L0LC) or call 0777 840507. Hyper Performance offer a special price for Toyota Vitz 2014 model for Rs. 4,350,000/-. This Toyota Vitz 2014 is 29,000km run car with full options. 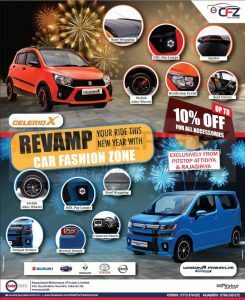 Hyper Performance offer a special price for Toyota Vitz 2016 model for Rs. 4,650,000/-. This Toyota Vitz 2016 is9000km run car with features of LED Package (Special Grade), Full Option, Push Start, ABS air bag, Dark Purple (Very Rare Colour) Exchange, Auto Brake, Lane Departure Warning & many more features.